In physical cosmology, cosmic inflation, cosmological inflation, or just inflation is the expansion of space in the early universe at a rate much faster than the speed of light. 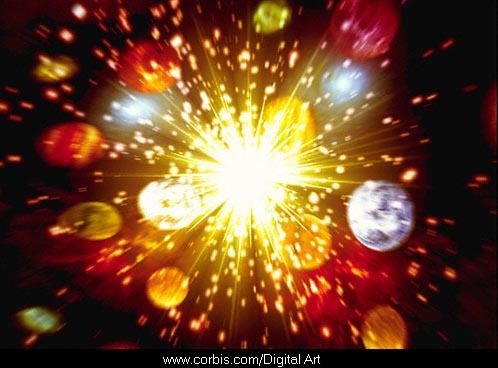 The inflationary epoch lasted from 10−36 seconds after the Big Bang to sometime between 10−33 and 10−32 seconds. Following the inflationary period, the universe continued to expand, but at a slower rate. 1. Why is the universe flat? That means, why is its geometry Euclidean? We experience such a universe but there is no good reason for that to be so. This is called the flatness problem. 2. Why is matter (the galaxies) uniformly distributed everywhere (i.e. homogeneous on the largest scales). How could galaxies, galaxy clusters, and superclusters have arisen from such uniformity? This is known as the smoothness problem. And the same is true in every direction (isotropic). This is called the isotropy problem. 3. Why are there no magnetic monopoles detected, when the Grand Unified Theory (GUT) predicts them in the early big bang universe? This is called the monopole problem. 4. Why is the cosmic microwave background (CMB) radiation so uniform in all directions in the sky? It is at a uniform 2.72548±0.00057 K temperature, but that is a problem because the radiation has not had an opportunity to mix up bringing the temperature of the universe into equilibrium. This is called the horizon problem. For these and other reasons inflation comes to the rescue. But what really caused inflation, that rapid initial expansion? What caused the sudden start and smooth stopping of the process? What is the physics behind it? The particle physics mechanism responsible for inflation is unknown. A hypothetical particle or field thought to be responsible for inflation is called the inflaton, an ‘unknown’ proposed to solve the above problems. It has been given a name and certain properties, the rest is unknown. Now it is claimed that from inflation theory they have a prediction that has been verified by observations. The question is, if you could discover what this inflaton field or particle is, would you have evidence for the big bang? Well, no, it is not that simple. Consider what is being observed. The CMB radiation is being studied and a map of a certain polarization mode in the noise from that photon field is teased out using numerous statistical filtering methods. Did they ‘directly’ observe the big bang? Not unless you redefine the meaning of the word ‘direct.’ No, they observed millimetre-wave photons (at about 150 GHz) at the surface of the earth, with a South Pole based telescope. This is the state of modern cosmology. Because you cannot interact with the universe, you can only observe what it produces, and you have to run statistical arguments based on what you observe. Is the discovery the ‘smoking gun’ of the big bang? This implies that it is something similar to just after a crime was committed and you found the guy holding the smoking gun. Well, even if that were so, you could still have the wrong guy, because you were not there to ‘directly’ see the crime happen. It is circumstantial at best. In this case it would have to be shown that the evidence could not come from any other possible source or mechanism. This is the problem with cosmology in general. Not only is the claim that inflation has been detected, but also that they have discovered the effects of gravitational waves associated with the initial big bang. 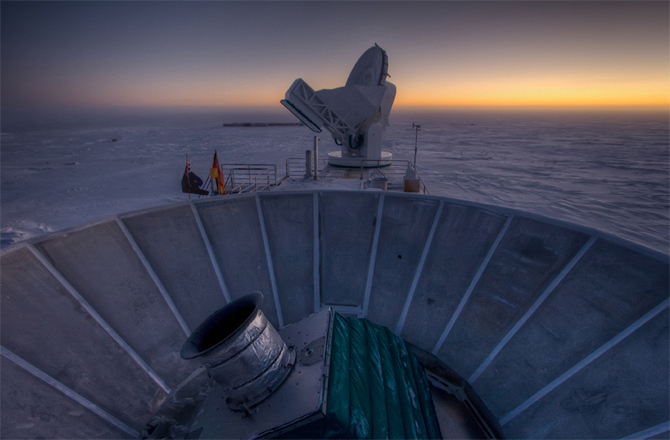 They claim they see the ensemble effect of primordial gravitational waves on the CMB photons. This is based on their modelling of what power should be expected in certain CMB fluctuations imprinted by gravitational waves from the big bang. Gravitational waves, a prediction of Einstein’s General Relativity theory, so far have not been detected with the very large earth-based interferometric detectors like LIGO. This current claim is that they have detected the signal of these inflationary gravitational waves in the B-mode power spectrum around l ~ 80 (l is a measure of the multipole expansion term used to quantify the power in the CMB radiation on different angular scales across the sky). The power spectrum results are perfectly consistent with lensed-ΛCDM with one striking exception: the detection of a large excess in the BB spectrum in exactly the l range where an inflationary gravitational wave signal is expected to peak. This excess represents a 5.2 σ excursion from the base lensed-ΛCDM model. We have conducted a wide selection of jack-knife tests which indicate that the B-mode signal is common on the sky in all data subsets. These tests offer very strong empirical evidence against a systematic origin for the signal. It is stated that various methods were used to exclude foreground contamination from the galaxy. In the data they have heavily filtered to extract the result they have modelled what a primordial gravitational lensed signature should look like. In addition they see an excess effect on the polarization of the CMB photons, over a particular angular scale expected from the theory. We only observe one universe. Due to this fact there arises the problem of ‘cosmic variance,’ because we do not know what a typical universe should look like. So even if they were able to separate the foreground contamination by modelling the expected signal from dust in the galaxy how could you know if your model was correct? You can’t test it on another universe. They claim to have subtracted “…the best available estimate for foreground dust …” after which a null detection is disfavoured at 5.9 σ. This relies heavily on what the modelling says a typical universe without a gravitational wave spectrum should look like. What you do is divide up the data set into various blocks from different regions of the sky and use that to generate a set of ‘different’ data sets. This is called ‘jack-knife’ which is used to give you some sort of estimate of your standard error in the measurements. Of course, it is all from the same universe and really this only gives a measure of the variation across the sky. Next you model what a typical universe should look like and generate mock universes, then compare your observed data to that from the mock universes. You can generate many mock universes and use them to create a statistic. But this belies the problem of ‘cosmic variance.’ It all depends on the biases you have in your model. They use the dark energy (Λ), cold dark matter (CDM) cosmology to construct their mock universes and compare the observed data to that universe. It heavily depends on the biases built into the model. Those biases also determine what data you accept or reject in the analysis. Besides, there still does not exist any laboratory evidence for dark energy nor dark matter. After that it is just modelling. These results are also suggested to tell us something about all the other universes out there, because if the inflation of this universe is correct then our universe must be only one of many bubble universes that have bubbled into existence and we just happened to have evolved in this one and now we are able to discover this. This is the multiverse, which solves the problem of why we are here. It is just random chance that we live in this particular universe—the ‘Goldilocks’ universe—not too hot, not too cold, but just right—for life to exist. This now shows the philosophical nature of cosmology. Only by first assuming the big bang cosmogony to be true, followed by cosmic evolution, does a discussion of a multiverse have any relevance. So much hinges on the ‘unknowns.’ And the ‘unknowns’ result from applying the particular cosmological model—now known as the ‘standard’ model—to the observational data. The fact that these fudge factors are needed does not seem to disturb the atheist world because this is what they expect from the universe. To me it would engender a lot more confidence in the science if the picture of the universe they obtained made sense. ‘It made itself.’ We must accept that as a given, and then we can discover how that happened. The universe began as God said in Genesis chapter 1, with no big bang. He created it out of nothing, by His supernatural omnipotence. God said: “Let there be light.” He filled the universe with light and that light might be what we observe today in the CMB radiation. My own cosmology—a derivative of Moshe Carmeli’s own big bang cosmology, but with biblical initial conditions—has a period of super-rapid accelerating expansion in the 4th Day of Creation, not quite the same as inflation, yet sufficient to adiabatically cool the initial light from a temperature of about 9,000K to nearly 3K today. I proposed that the initial light was due to plasma glowing blue, which filled the initial much smaller universe. That initial plasma would have had sound waves resonating through it. And gravitational waves are entirely possible real physics, though they have yet to be shown to exist. Even the case of the Hulse-Taylor binary pulsar-neutron star pair, the discovery for which they were given the Nobel Prize in 1993 (where energy is lost as the binary pair spiral in towards each other), shows only that gravitational energy is lost, not that that gravitational energy is dissipated in waves. My point is that even if this detection of an anisotropy in the excess B-mode polarization of the CMB photon field at the claimed angular scales is confirmed it may not be evidence of anything more than an effect resulting from some other source in the universe. You would have to rule out all other causes before you could definitely say it was a detection of the big bang. But to do that you would have to know everything and that would make you a god. Far from being a definitive proof of either inflation or the big bang, this so-called ‘smoking gun’ is very ‘model-dependent’, which means it depends on unprovable assumptions—including that there was a big bang to begin with. Whereas even the idea that the CMB is the leftover echo of this alleged event has some serious and unresolved problems; for example, if the radiation really is coming from deep space, why is there no ‘shadow’ in it from objects supposedly in its foreground? See The big bang fails another test. Clavin, Whitney (17 March 2014). “NASA Technology Views Birth of the Universe”. NASA. Retrieved 17 March 2014. Overbye, Dennis (17 March 2014). “Detection of Waves in Space Buttresses Landmark Theory of Big Bang”. New York Times. Retrieved 17 March 2014. Cho, A., “A singular conundrum: How odd is our universe?” Science 317:1848–1850, 28 Sept 2007. This implies a GUT (Grand Unified Theory) or some quantum gravity theory of the early universe, not the successful theory we use in the lab in particle physics.